We've seen the LG G4 announcement, we've reviewed it, and we know all five of the major carriers will sell the device. Now it's just a matter of finding out when. Today Sprint has announced that it will start selling LG's latest flagship on June 5th, and you can pre-order one right away in leather black or plastic gray. If you buy one between now and June 21st, you get an extra battery, charging cradle, and 32GB microSD card in the mail for free. The G4 will go for $600 outright, $200 with a two-year contract, $25 a month for twenty-four months with Sprint Easy Pay, or $18 a month with Sprint Lease. While it's not explicitly written anywhere, they might also give you one if you head to the nearest carrier store and start throwing twenties at the window. David Ruddock, as some of you may know, is somewhat or a critical reviewer. But he went so far as to call the G4 perhaps the most practically appealing of 2015's flagship phones. You get a Snapdragon 808 processor, 3GB of RAM, a curved 5.5-inch display, and a 16MP rear camera. The sizable 3000mAh battery is removable, and there's a microSD card slot. LG's included software remains quirky as always, but some people find it somewhat charming. You have two weeks left to decide if you want one on day one. Or, you know, you could pick it up at any point after that. No one's rushing you. Well, the free stuff kind of is. There's that. 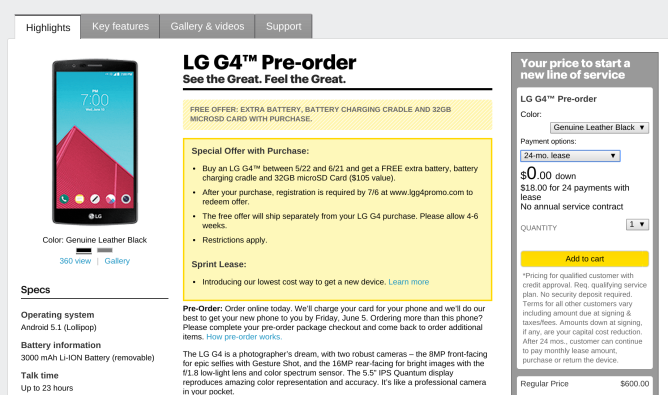 OVERLAND PARK, Kan. (BUSINESS WIRE), May 22, 2015 - The highly anticipated LG G4™, boasting an impressive collection of photography tools, will be available in all Sprint (NYSE: S) sales channels, including Sprint Stores, Telesales at 1-800-SPRINT1 and www.sprint.com, beginning on Friday, June 5. 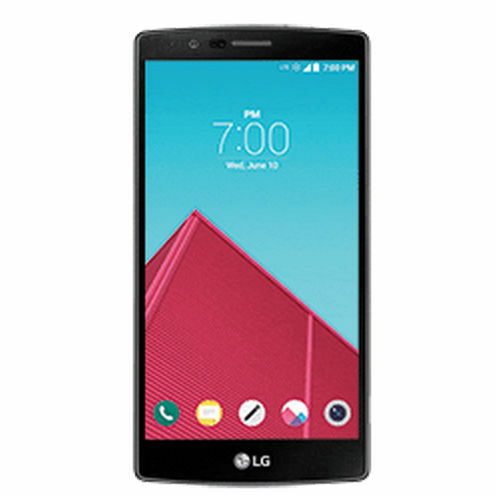 Offered by Sprint in two color options, Metallic Gray and Genuine Leather Black, LG G4 is an ideal gift for Father’s Day or graduation. Sprint Lease: LG G4 will be available through Sprint Lease for $0 down at signing and $18 per month. With Sprint Lease, qualified customers pay zero out of pocket at lease signing for their smartphone1. Stuck in a contract with another carrier? Sprint will pay whatever it costs to switch, including early termination fees and remaining payments on the phone installment plans – no matter what is owed. Customers simply need to switch to Sprint and turn in their current phone. Sprint will refund the switching costs within approximately 15 days of successfully completing the online registration and providing a bill that shows the early termination charge or device balance due. Manual Mode provides DSLR-like capabilities to adjust shutter speeds, ISO, white balance and more, with the ability to preview the photo before you snap the picture. Laser Auto Focus technology allows you to take exceptionally fast photos so you never miss an opportunity to capture the moment. Color Spectrum Sensor captures images with accurate and bright colors limiting white balance distortion. Fast shutter speed gives more stabilization and excellent quality pictures in low light with incredible detail. Take LG G4 on all your summer adventures with the ability to create production quality prints at 11" x 17" with 300dpi.